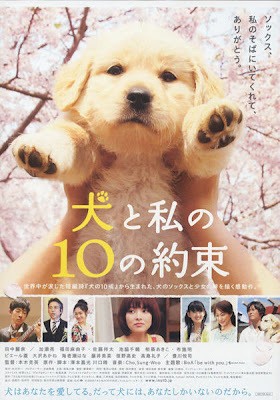 The Japanese movie "10 Promises to My Dog" by the same producers of "Quill" has hit the cinemas recently and probably sparked off another golden retriever and puppy craze. Having a dog is a huge commitment, so before you go out and buy yourself or somebody else a cute little fluffy golden retriever puppy or any other dog for that matter, make sure that you are able to fulfill these ten promises to your dog first. If you are a dog owner, make these promises to your dog today! I hope every human makes true those promises! All hoomans should read this. We should learn from dogs a great deal of things, but the most important one is how they are capable of offering us love, trust and compassion. Their support is always there, and the least we can do is to try to return what they offer us. I have something for you. Check out my blog. Few things compare to that kind look in your dog's eyes. PS: I will link this post in Pipa's blog.